Let your favorite player know you think she's the greatest - no matter what her stats are! The our softball champ's the star lets her know you're behind her all the way. These sports ornaments personalized from Russell Rhodes include her details along with custom words from you, and they arrive ready to display in our plush velvet gift and storage pouch. There is room on the back for a longer message of support or admiration from you, at your option. 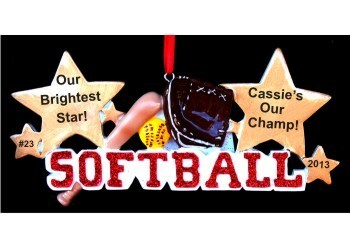 Your gal will be delighted by the softball star personalized Christmas ornament now, and it will be a cherished memento in years to come! Enter up to 7 characters.